EM-M43 is an optical isolator designed for input isolation of computers and PLCs. Isolator input is for 4...20 mA signal. Unit provides high isolation voltage. 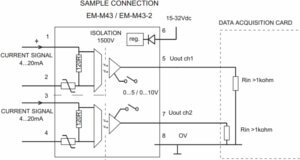 The isolators accuracy is sufficient for 12-bit applications. The unit acquires energy to its primary side from the current loop. Input stage is protected against over current. Output signal can be chosen to be 0...5V or 0...10V. The operating voltage range is wide and isolator supply is protected against incorrect polarity. Unit is packed in a rail-mountable housing and is available in 2 channel version as well. With 2 channel model the need for space is only 10mm/channel. The type code for 2 channel unit is EM-M43-2.